At daylight, my buddy Jon Fisher and I sat in the parked truck drinking coffee and listening to the Allman Brothers’ “Blue Sky” while fat raindrops whacked the windshield and pelted the sand. I cranked the wipers up on high to help scrape the old bug bodies off the glass. Between swipes we could see boats with hunched-over passengers cringing as they made frantic runs back up the Aransas Channel toward safety. My old dirty truck was worth a lot less than those boats, but it was a much better place to be in a hard rain. After an hour or so, the heavy stuff had moved inland. We launched our kayaks and made a quick paddle toward a steep bar directly across the channel from where we had parked. We beached the kayaks on the bar, hopped out, and began blind casting into the depths of the channel. I nervously shifted my eyes between the water and the clouds to make sure the storm wasn’t going to somehow reverse directions and swoop down on us like mice on a barn floor. Fortunately, the clouds continued to drift westward. An hour and a half later, we were still casting off the bar without so much as a tap to show for our efforts. The skies had given us a break, but the fish hadn’t. I plopped down on the grounded kayak, picked through a fly box and wondered what it would take to pull at least one fish out of the channel. Just then, a slender shadow zooming down the sandbar caught my eye. The fish darted slightly off-course as it approached, cracked a baitfish nearly at my feet, and then vanished into the depths. A few minutes later another grey shadow appeared and made a blazing run down the shore searching for an errant baitfish. I shot a cast out ahead of him, leading him like a dove with a tailwind. He grabbed the fly without slowing down and in an instant ripped out 100 feet of line. 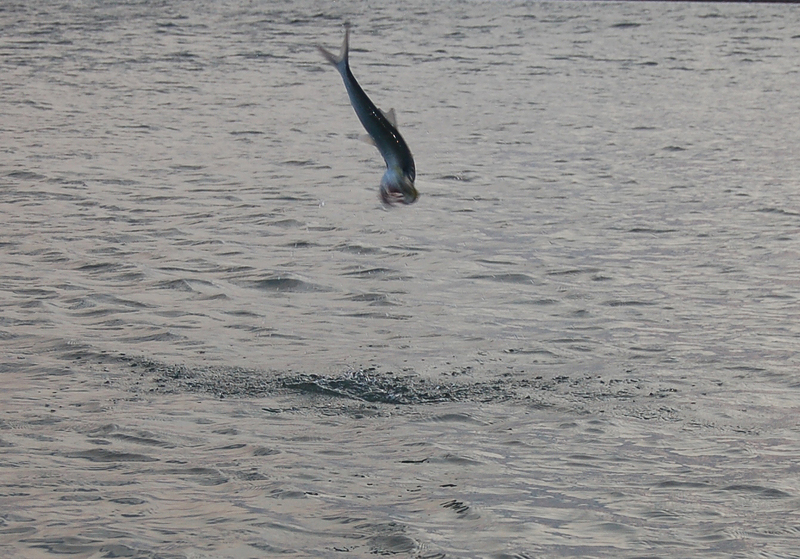 “Skipjack… a big one!” I hollered to Jon, as the fish did his first aerial end-over-end. A few minutes later, he was flopping at my feet, still trying desperately to get away. The drag-ripping power of that slender fish reminded me yet again of how much I love to catch skipjacks. 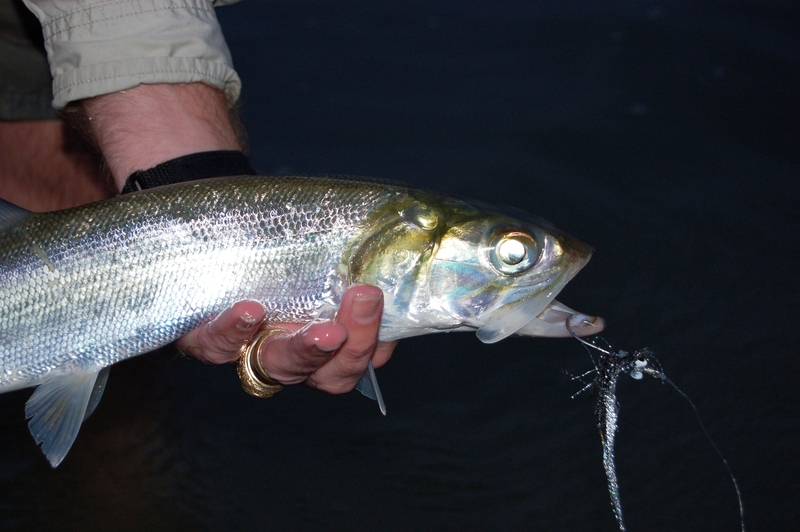 Skipjacks, more properly known as “ladyfish,” are in my opinion one of the most underrated fly rod targets on the Texas Coast. They travel in huge schools, have a voracious appetite, and go berserk when you hook them. Big skipjacks will test your tackle and your angling skills with line-searing runs that are solid match for an 8wt. rod. Skipjacks have amazing speed too. Several years ago, I hooked a really big one in the Padre Island surf. It seared off half of my backing in about 10 seconds. What more could you ask for? 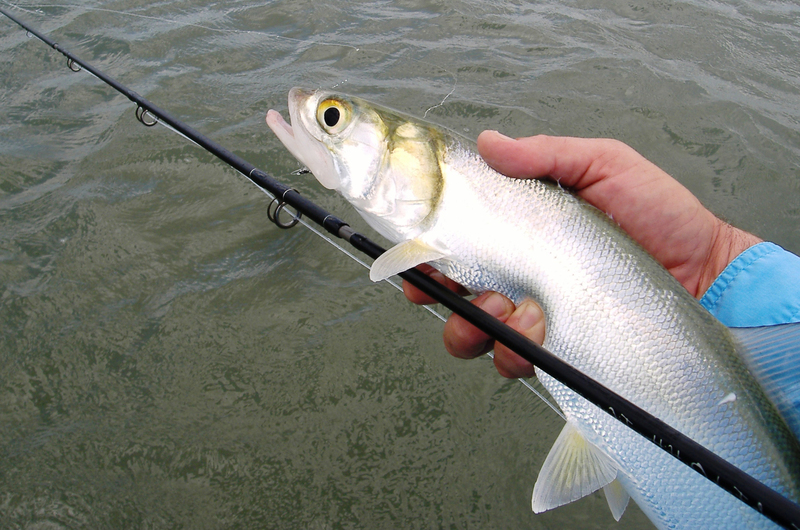 Most coastal anglers have encountered or caught skipjacks while fishing for other species. Large channels, jetties, and surf zones are great places to find them. Sometimes skipjacks can be seen banging the top in huge blitzes with gulls diving over them. Other times they just fly around below the surface chasing down anything they can grab. Skipjacks also feed in the shallows, but they can be tricky to land unless you are in an area like the hard sand flats of the lower Laguna Madre. Fly fishing for skipjacks isn’t rocket science, but there are a few tricks to hooking and landing them. First and foremost, skipjacks love a moving target. 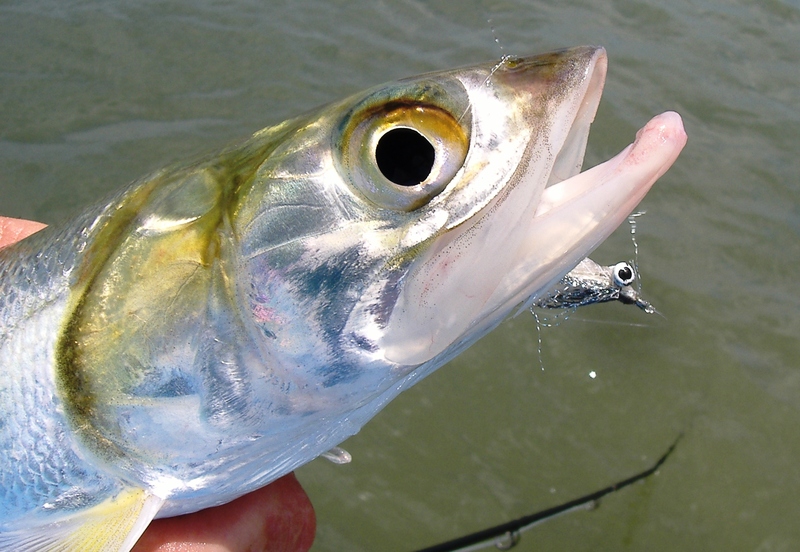 Skipjacks will hit all kinds of flies, but the ones they hit the most are the ones that keep moving. I suppose this is due to the combination of keen eyesight and speed the skipjack possesses. Too keep a fly moving, try using a hand-over-hand retrieve. This style of retrieve produces a continuous fly movement. If you have not mastered the hand-over-hand retrieve, use short, rapid, staccato strips, or very long fast strips. The important thing to remember is to keep your fly moving, the faster the better. When a skipjack strikes, quickly strike back. Sometimes they hit hard and hook themselves, but other times they nip at your fly and never seem to get the hook. When this happens, switch to a smaller pattern, or make a faster retrieve, or both. Eventually you’ll tag one and the fight will be on. Skipjacks don’t have sharp teeth like a mackerel, but their boney mouths are extremely abrasive and will quickly fray and weaken a leader. For this reason, I generally use a 12 inch section of 30 lb bite tippet. Lighter tippets will work too, but they will eventually result in lost fish and flies. No matter what size tippet you use, check it frequently for damage. Eight weight rods and either floating or intermediate lines are a good match for skipjacks. Reels should have a smooth drag and be equipped with 100 yards of backing. Skipjack flies need not complicated. Simple durable baitfish patterns with a bit of metallic flash work well. Clouser Minnows and Surf Candies tied on #2 or #4 hooks are fine. If you have a choice, go with smaller patterns rather than large ones and remember that whatever you throw at skipjacks will likely be destroyed. So, it’s probably not a good idea to cast high dollar flies unless you enjoy watching them disintegrate. Hyperactive skipjacks have a habit of releasing themselves, which is good because they are really tough to handle and unhook. The best way to do it is with a Boga Grip. There are two reasons for this. First, it’s hard to grab a slimy wriggling skipjack without squeezing the life out of him or penning him against your belly and smelling like skipjack for the rest of the week. More importantly, skipjacks are on the menu of nearly every large predator in the sea… especially sharks. If you are wading in the surf catching skipjacks, be careful. A helpless flopping skipjack is an ideal target for a shark, and the shark won’t care if he grabs your fingers, your belly, or the tip of your flyrod along with it. 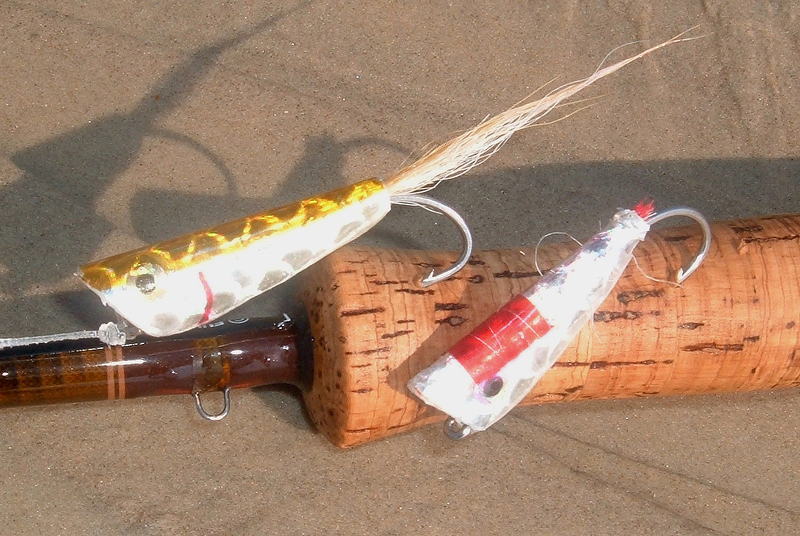 A Boga Grip allows you to keep the skipjack at least partially away from your fingers and your body. An even safer alternative is to lead the fish toward the beach and handle him there. The next time you have an opportunity to tangle with skipjacks, take advantage of it. Their strength and speed make them a top notch fly quarry and their sheer numbers can wear you out. If you’re game, skipjacks are nearly always willing to play.